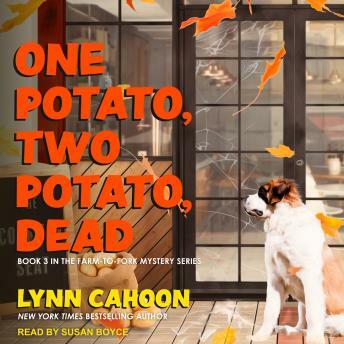 Listen to "One Potato, Two Potato, Dead" on your iOS and Android device. Angie Turner's restaurant, The County Seat, is conveniently located near a first-class farmers market-so her menu is full of fresh ingredients. But a visiting culinary professor has just had a taste of something very unhealthy . . .
Angie first meets Daniel Monet at a local mission, where she and her chef-in-training, Hope, are serving barbecued chicken poutine to the homeless. Monet is one of Hope's teachers-but Angie's boyfriend knows him from his youthful days in England. But soon, the bon vivant is no longer vivant. When Monet is found dead, with Hope's prints on the wine glass next to him, it will be Angie who has to sauce out the real killer . . .